We are pleased to let you know that in 2019 SME will be consolidating all of its peer-reviewed technical papers into one all-SME journal called Mining, Metallurgy & Exploration (MME). MME will be the new name of Minerals & Metallurgical Processing (M&MP) as of Vol. 36, No. 1 (2019), and SME Transactions and the “Technical Papers” section of Mining Engineering will be merged into MME, to form a journal that covers the breadth of SME’s fields of interest. MME will be published in partnership with Springer Nature and will be freely accessible online by SME members through Springer Link. In addition, through the extensive Springer network, MME papers can reach up to 7,000 libraries and institutions and 20 million desktops worldwide. Importantly, MME will retain the Journal Impact Factor from M&MP and will continue to be included in the Journal Citation Reports, as well as abstracted and indexed in Science Citation Index Expanded, Current Contents-Engineering, Computing & Technology, Scopus, EBSCO and Proquest. All papers published in MME will also have their abstracts published in Mining Engineering magazine. MME will have an increased frequency of six issues a year, and it will have no restrictions on number of article pages, figures or tables. 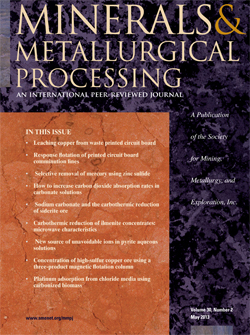 M&MP: SME's international peer-reviewed journal brings you the latest research in the processing of minerals and metals. Published quarterly, in February, May, August and November, this journal is available by subscription only, either online or in print and online. We cover developments in a wide range of applicable disciplines, from metallurgy to computer science. Our authors, experts from industry, academia and the government, present state-of-the-art research from around the globe. In addition to regular full-length papers, M&MP also publishes occasional reviews, invited features and technical notes (shorter case studies). For information on how to submit a paper, click here . M&MP sets itself apart from its competitors by its focus on industry research, in addition to academia and government work. Fully a third of its papers each year come from respected industry researchers, and a third of its editorial board members work in industry. In addition, M&MP produces high-quality papers and reaches a broad audience through distribution to key meetings and conferences, including the SME Annual Meeting, CIM, PDAC and many others. M&MP accepts limited advertising; click on advertising for more information. Inquire about possible promotion deals with our advertising manager, Ken Goering, 303-948-4243, goering@smenet.org . From Journal Citation Reports®, 2017 release, a Clarivate Analytics product.